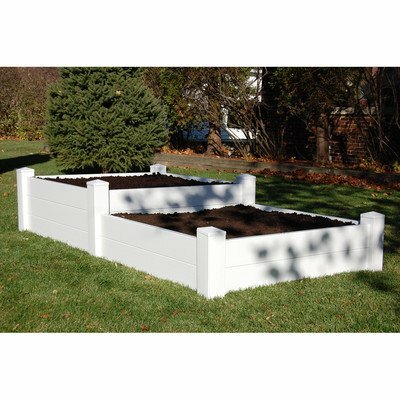 Crisp white with straight lines and a substantial design, the Dura-Trel 4 x 8 Rectangle Split Level Raised Planter Bed makes growing vegetables look like a refined, beautiful, and clean affair. The two levels are designed for different types of plants: put your root crops like carrots and potatoes on the top deep bed, and grow your shallow-rooted peas and spinach on the bottom. You'll have fresh, organic produce at the end of the season without needing to till and season a section of your lawn. The 4 x 4 inch posts sink six inches into the ground, and the rails measure 1.5W x 5.5H inches with two reinforced webs inside for added strength. This planter bed is made from PVC with a UV stabilizer so it won't rot, crack, or fade even after years of exposure to the elements. It arrives totally fabricated, and includes all hardware for quick and easy installation. Made in the USA. Dimensions:Upper level: 48L x 45W x 17H inches Lower level: 48L x 45W x 11H inches About Dura-Trel Inc. Durability, versatility, reliability, and quality. These are the cornerstones of Dura-Trel's commitment to you. Our lawn and garden selections are an unbeatable and maintenance-free enhancement that can help transform the outdoors from average to outstanding. As you would expect from a national corporation with over 25 years of experience like ours, we offer competitive pricing and quick delivery. But we also have something our competitors don't - a custom production process that blends the efficiency of large-scale manufacturing with the time-honored qualities of hand-crafting traditions. Dimensions for 2 levels listed below. 100% maintenance-free PVC. UV stabilizer prevents color from fading. 2 levels designed for different crops. Easy to assemble with simple instructions. 20 year warranty.